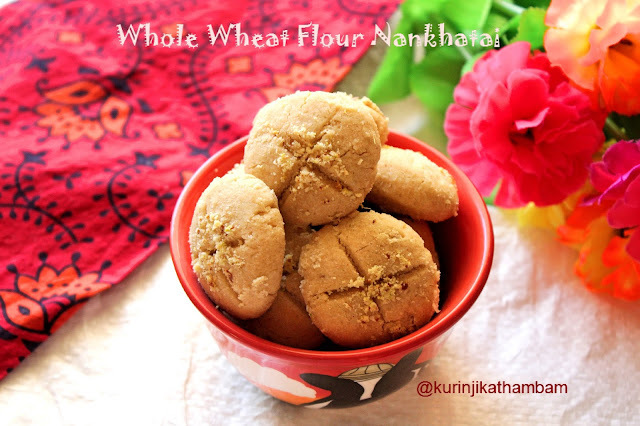 Nankhatai is a famous cookie in North India. 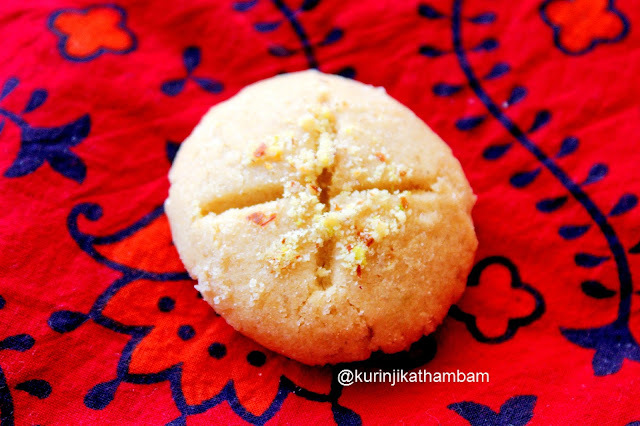 I have already posted Besan Nankhatai earlier. Recently I joined Fondbites face book group. In this group there is program called Bake Along every week, the admin will post a recipe and members should prepare and post the photos of the recipe. This is my preparation for this program. 1. Powder the sugar with cardamom in a dry mixie jar. Keep it aside. 2. Coarsely powder the nuts using the same jar and keep it aside. 3. Add whole wheat flour, powdered sugar and salt in a wide bowl. Mix them well using the whisk. 4. Add the ghee into the above mixture ( first you can add ½ cup only) and mix with your hands. 5. 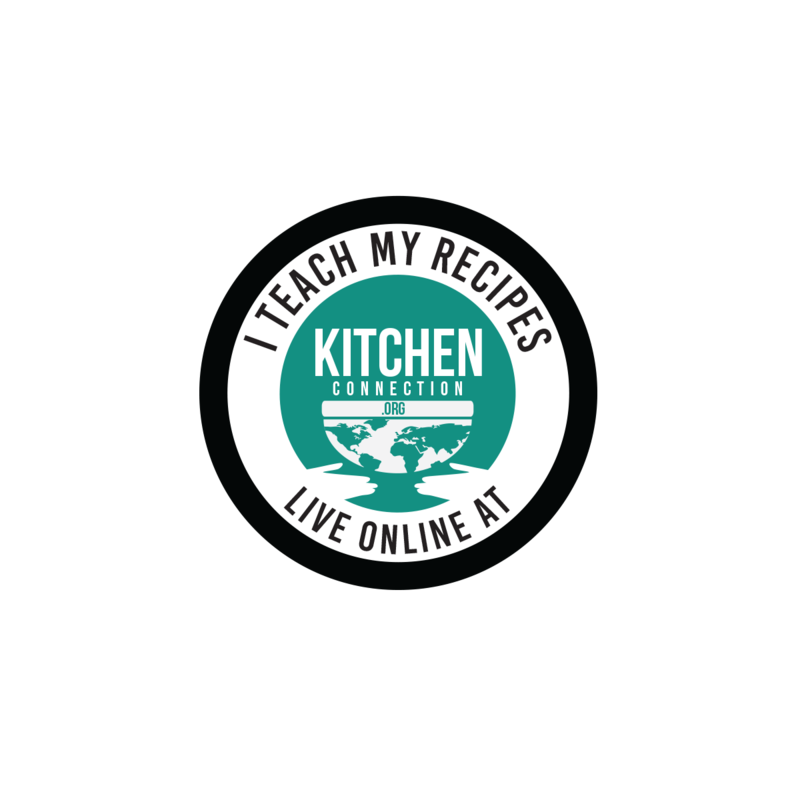 Adjust the ghee level and knead it into a soft and smooth dough. 6. Now make gooseberry size balls from the dough. Then press the balls gently and make small circles from the balls. 7. Using the knife you can make cross pattern on the top of the circles. 8. Then place a pinch of powdered nuts ( from 2) at the center of the cross and press it gently. 9. Meanwhile, pre heat the oven for 180 degree Celsius. Arrange the cookies on the baking tray. You can leave 1 inch space between the cookies. 10. Bake the cookies at 180 degree Celsius for 10-12 mins or until they turns into golden color (mine took 11 mins). Allow it to cool down and serve. Aromatic and tasty cookies are ready to serve. 1. Adjust the sugar level according to your taste. 2. Add any nuts of your choice.